Today was the first day of school. It was my 9th first day of school as a teacher, and it was the best one yet. This was the first year that I didn't feel nervous the night before (which I did think was weird - I was actually a bit worried about that). I felt as ready as I could be (I had even blogged about it, which come to think of it might be part of the reason I felt calmer...hmmm, maybe there really is something to this writing thing). I was excited to see my students again - I had missed them. I read six picture books last night before going to bed (taking my total for the summer to 92!). I set my alarm nice and early so I wouldn't feel rushed in the morning. I laid out my clothes and shoes. I went to sleep (we won't talk about the three times I woke up throughout the night - this seems to be a common thing with teachers on this big night). I was still excited, and not nervous, when I woke up and got ready this morning. I had a feeling it was going to be a great day...and it was. What did we do today? We talked books. We looked at the classroom library setup. We saw how Booksource's Classroom Organizer works. We chose our first books of the year to check out. We started reading. We got cool WONDER-themed bookmarks reminding us to "choose to be a little kinder than is necessary." We saw the awesome floor cushions and poufs that are the newest addition to the classroom (with more to come since they were such a hit, we'll need enough for everyone to have a pouf). 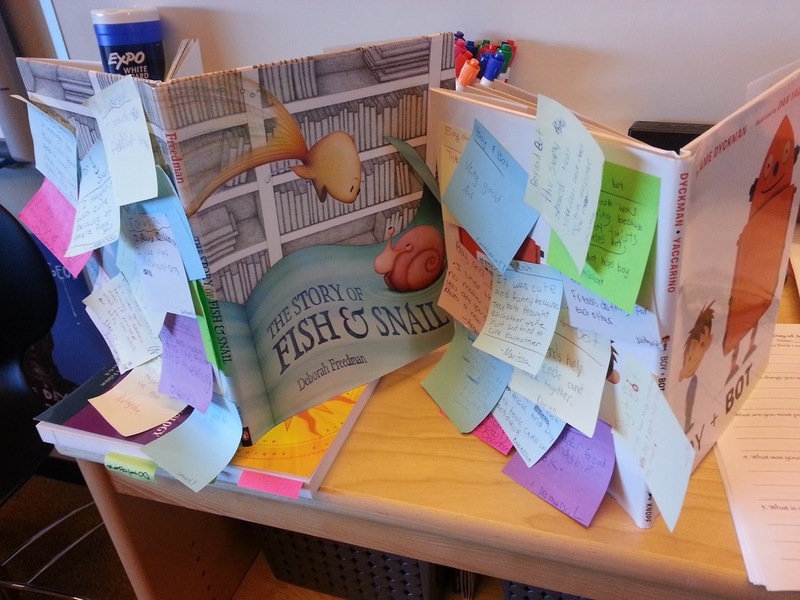 We shared picture book read alouds (THE STORY OF FISH & SNAIL and BOY + BOT). We responded to those stories individually and then thought about the common themes and why they might have been chosen specifically for today. We started (or in the case of the 8th graders, continued) to become a community of readers in our classroom. I needed a place to collect the students' jots of their thoughts responding to the read aloud books, so on-the-spot decided to have them stick them on the back cover. They loved it (and it worked so well)! There is definitely something to this looping thing. Knowing that with my 8th graders we could just pick up where we left off and didn't have to do any of the get-to-know-you stuff was great. Being in a small school where the 6th-8th grades are on the second floor, so I knew all of the incoming 7th graders by face, and most by name, made for a smoother transition into the year with a new group of students. By the end of the day I was just so happy to have my middle schoolers to talk books with again. This community is what it's all about...because if it starts with that, learning will be the inevitable end result. We have lots of books to share, read aloud, and discuss. We have lots to write about. I can't wait to see what the next 179 days brings. Just wanted to say I'm enjoying your writing blog!